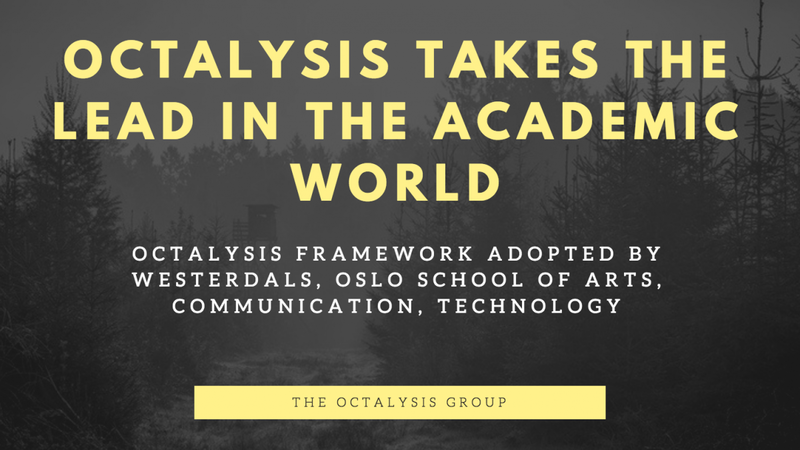 Home > Octalysis News > Octalysis taking lead in the Academic world! The gamification market is estimated to grow from USD 1.65 Billion in 2015 to USD 11.10 Billion by 2020. This increasing demand is bringing more and more actors to the global market. Since Yu-Kai published the Octalysis Framework in 2008, it has been organically translated into more than 20 languages, and the book was recently translated into Chinese and Korean(!). But Octalysis is also making large forays into academia. For example, this year, Actionable Gamification was chosen as the curriculum framework for the first intensive Gamification course at Westerdals, the Oslo School of Arts, Communication and Technology. More and more people are taking interest in Gamification, but the term is still not well-known in the Norwegian market. When we created the course last fall, we didn’t have many resources to market it to the Bachelor and Master students. When the listings came late December we were happy to see that many people had applied and joined our course. It was quite interesting to see the diverse background of our students, a reflection of the wide range of bachelor degrees and courses that Westerdal offers. The degrees range from game design to digital marketing and from programming to sound design. The curriculum was mainly based on Yu-Kai’s book Actionable Gamification (get it here if you haven’t already). The course started by covering the history of games and play, and we did a fun game to see what (simplified) player types were most dominant in the class. With students from creative fields, it was no surprise that most students were dominant Explorers type categories, while the 2nd largest group were characterised as Achievers. A great balance of creativity and effort then! From here we discussed behavioural economics and psychology with theories from Daniel Kahneman, Csikszentmihalyi and Daniel Pink. Each session led to a discussion or exercise where we’d discuss Norwegian products and cases and come up with improvements through the 8 Core Drives of Octalysis. We spoke about White Hat and Black Hat design as well as Intrinsic and Extrinsic motivation. The Norwegian examples ranged from a grocery application launched this year by Rema 1000 (‘Æ’), Parked Piano (a cultural initiative placing pianos in public locations for anyone to play) to McDonald’s’ ‘Find a bacon clubhouse’ website. In just a month’s time, the students had three different group presentations and one group exam in the end. Actionable Gamification is a thorough book and one you come back to over and over, but the students were all able to grasp the framework and implementation very well in such short time! During our month we were also lucky to get visits by other lecturers, such as Game researcher Amit Ginni Patpatia, behavioural researcher Asle Fagerstrøm and the Managing Director of TOG, Joris Beerda. The final exam asked the students to describe an area of society where gamification should be introduced and to discuss how today’s solution can be improved through gamification. The students came up with their own cases ranging from improving the public transport system in Norway, to making elderly care a lot better and creating good habits for recycling plastic bottles! We were very happy with the high level of engagement from our students, which also became evident with the close to 100% attendance rate. Big thanks to Assistant Professor Jannicke Johansen and Westerdals ACT for taking action and collaborating to set up the course. Westerdals has actually incorporated these intensive courses as part of their competitive strategy to interdisciplinary education for all students attending. Thanks to all the students for taking part in lectures and making the first course a memorable one! As more and more Norwegians are introduced to Gamification we at The Octalysis Group are excited to be in the forefront of the Norwegian scene, and that the course will be repeated next year! Want help making your product, experience or workplace engaging?